You wanna know something that annoys me about dieting or eating healthier? It’s all the dumb “healthy snacks” folks suggest. Peanut butter and celery? What tha! Rice cakes with honey? Um and no. Apples with honey? Just stop. Please. Healthy snacks should taste GREAT! Agreed? 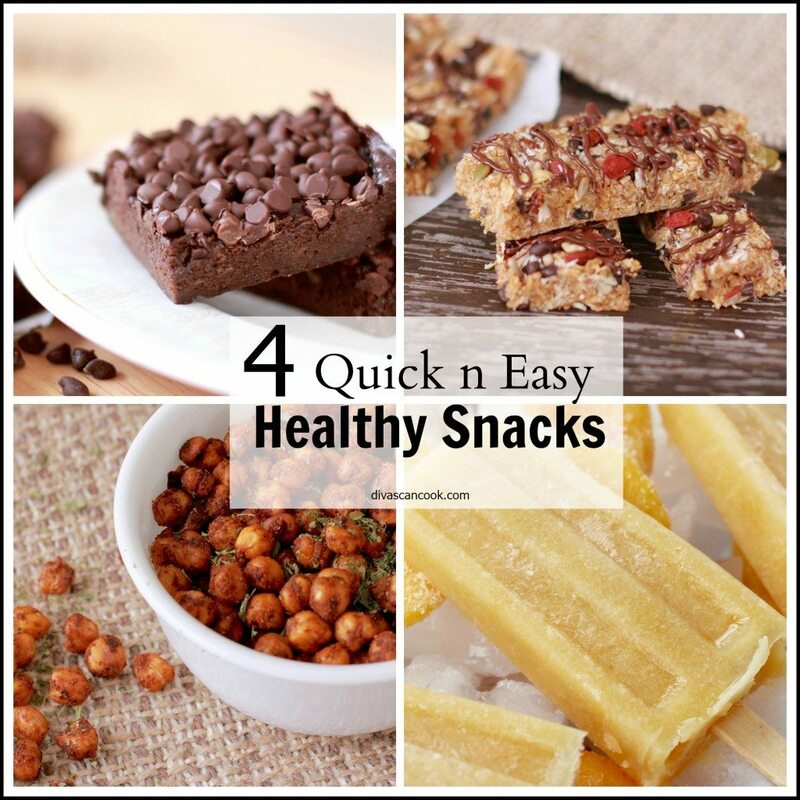 Good because I’ve got four of my favorite healthy and delicious snack recipes to satisfy your salty, crunchy craving all the way down to your soft and chocolatey cravings! And to make it even more amazing, they are all so quick and easy to make! You can watch me make all of these healthy snacks in the video below! First up are these healthy, super chocolatey, chewy avocado brownies. WAIT DON’T CLICK OFF!! I know avocados have no business being in brownies but TRUST me you can’t taste them at all. It’s simply there to add some much needed fat into these brownies since we aren’t using butter. The avocados it’s what makes these brownies so daggum moist and chewy. My husband absolutely loves these brownies! The texture is amazing. Thick, dense, fudgey, chocolatey, and chewy. I prefer to keep these brownies in the fridge for there best texture. I used EnjoyLife daiy-free, nut-free, and soy free chocolate chips. To me, they aren’t as sweet as regular chocolate chips but I really like the ingredients in them. Line a 8 X 8 inch baking dish with greased parchment paper. Set aside. In a large bowl mix together avocado, agave, coconut oil, eggs and vanilla extract. Stir in cocoa powder and salt. Bake for 25-30 minutes or until center is set. As soon as brownies come out of oven sprinkle the tops with chocolate chips. Allow the chocolate chips to melt slightly and then place the brownies into the freezer until chocolate is firm. 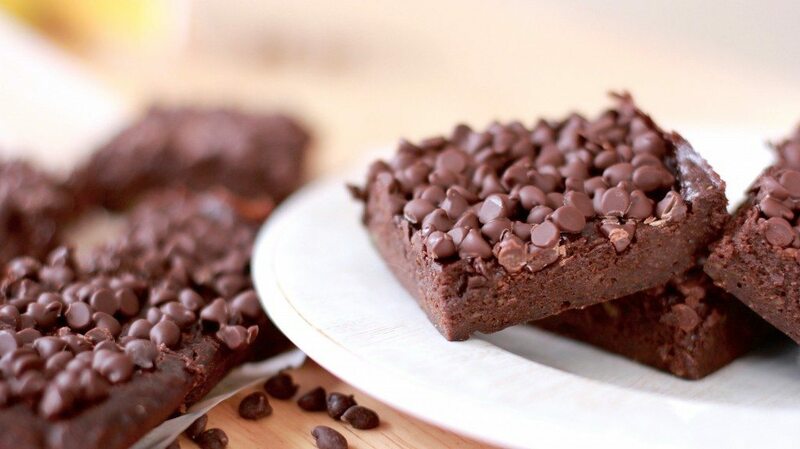 Cut cooled brownies into squares. Love trail mix? Love granola bars? 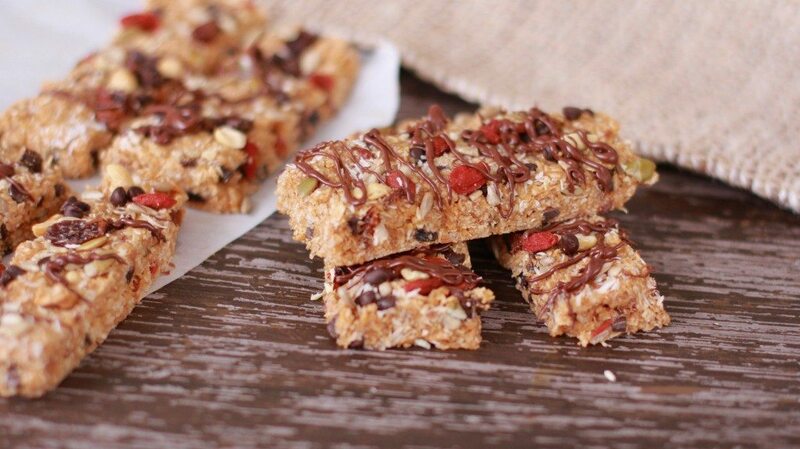 Then you are probably gonna freakin love these trail mix granola bars! I know I do!! They are chocked full of all kind of healthy deliciousness and makes the perfect snack for after a workout or to hold you over to your next meal. You can cut these trail mix granola bars into bars, roll them into balls, or crumble them up into clusters. Either way they are fun to eat! The honey and peanut butter creates the perfect healthy “glue” to hold together all of the ingredients. The results are a chewy, crunchy yet soft granola bar. Use your favorite trail mix variety. I used a superfood blend that had goji berries, raisins, and a variety of seeds and nuts. Line a 8 x 8 glass dish with h greased parchment paper. Set aside. In a large bowl stir together peanut butter and raw honey. Stir in coconut flakes, quick oats, rice krispies, mini chocolate chips and trail mix. Firmly press mixture into prepare pan being sure to pack it in super tight. Press on more trail mix if desired. Freeze until firm and set. Drizzle with melted chocolate if desired. For some reason I really like the words “Honey Peach”. I think I’ll start saying that now instead of honey boo. Just sounds more.. southern. Peaches and honey… honey and peaches… what an amazing combination! 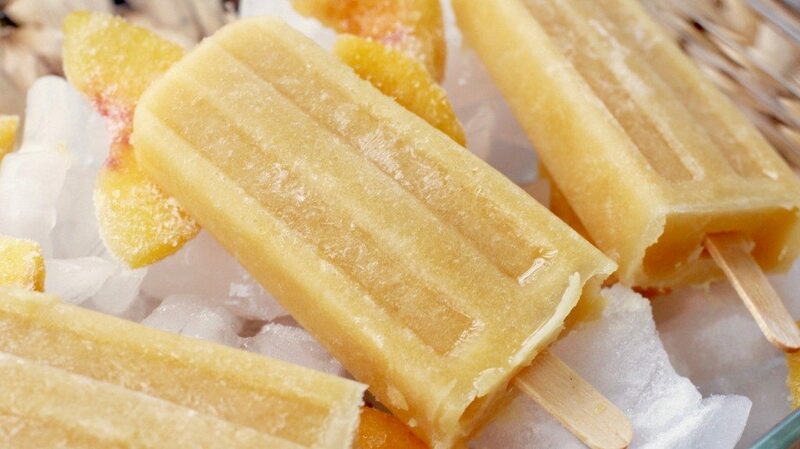 I adore these creamy honey peach popsicles so much! And with only 3 simple, natural ingredients what’s not to love right? These healthy honey peach popsicles come together so quick and they are a great way to use use leftover peaches. Puree peaches and almond milk in a food processor. Pour into a large bowl with a spout. Pour mixture into popsicles molds. Be sure to "over sweeten" the mixture a bit. Even though it will taste really sweet, once it's frozen the sweetness comes down a lot. Think of eating a melted freeze pop, it's super sweet when it's melted but once frozen it's not as sweet. I’ve been on a serious roasted chickpeas kick lately. Have you ever had roasted chickpeas? If not, you are in for a crunchy, savory treat! 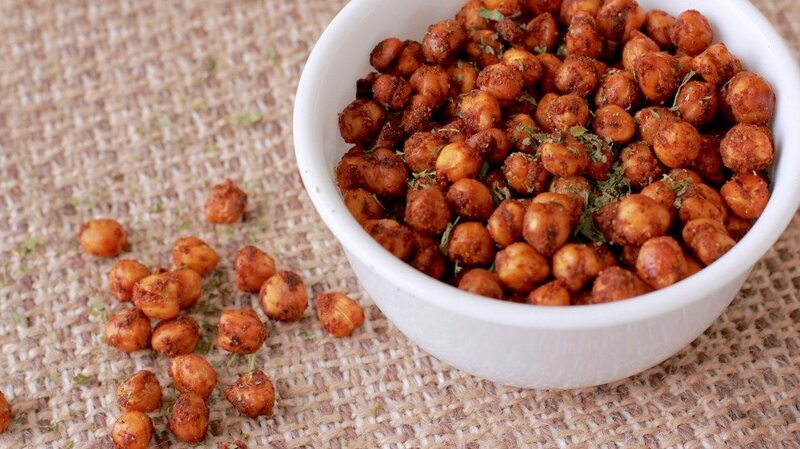 You can really season these roasted chickpeas with whatever you want. Go savory or go sweet. They seriously taste great either way. But we really like these taco-flavored chickpeas! They are probably one of Ethan’s favorite movie snacks. It works out great since he’s not old enough for popcorn. just be sure to remove the skin if you’re serving to little people since they can get stuff in the throat. Let me warn you though, they are super addictive! As soon as they cool off we raid the pan. Yep they are that tasty! Try them! Line a baking sheet with greased parchment paper. Set aside. Drain, rinse and completely dry the garbanzo beans. Place beans in a large bowl and add a few drop of olive oil to lightly coat. Gently toss beans to distribute the oil. Sprinkle seasoning over beans and toss gently to coat. Spread beans in an even layer on a baking sheet, being sure to space them out. Remove from oven and toss. Bake for another 15-20 minutes. Remove from oven and sprinkle with more salt if desired. Remove the skin of garbanzo beans if desired. I just usually its leave them on. What is the amount of carbs in the brownies? wow! i’m definitely trying these recipes! Can I leave out the avocados for the brownies if I am allergic to them? Thank you. Where can I buy those popsicle molds?